Importing a classic car is something many of us have thought about in recent years. With the internet opening up all manner of new buying opportunities, and currency fluctuations sometimes making some ventures profitable as well as desirable, it's becoming a whole lot more popiular to ship in. After all, there’s a rich seam of classics to be tapped into, so wouldn’t it be nice to bring one or more home? Most people tend to look at Europe to import classic cars from. And warm, dry areas such as Greece and the Mediterranean islands are a plentiful source of cheap, rot-free classics, especially considering their depressed economies and low asking prices. Classics are being wiped out from Italy and Spain, though, and many will have already crossed over into neighbouring countries where the prevailing financial conditions are better. But there are still plenty around if you know where to look - but do avoid sellers with ambitious prices. It's a tough market. Other good places to look are Southern Hemisphere right hand drive markets. The ex-colonies such as New Zealand, Australia and South Africa are always worth a punt. Strong historical links with the UK means these places are a rich source of classic British metal, and in many cases, you can pick up locally produced versions of some well-known cars - often with improved specifications and build quality. On the whole, climates down there are better than the UK. First thing's first, you'll need to ascertain how much import your proposed classic it is going to be liable for. Your first port of call for more information is Customs and Excise, and there are a couple of major import permutations to choose from (EU and non-EU countries), so make sure you’re up to speed with what you’re liable for before you start totting up your costs. The most appealing way is to drive it back to Calais, hop on a ferry and declare it when you arrive at Dover – and with regular crossings by P&O, you can get over flexibly and cheaply as long as you book in plenty of time. Insurance cover, local tax and a roadworthiness are essential for this, but your main insurer should be able to offer you temporary cover on a foreign registered car until you get it squared in the UK. Certainly classic insurers, such as Carole Nash or Hagerty can. And let's face it, buying a classic and driving it home can be a real adventure. 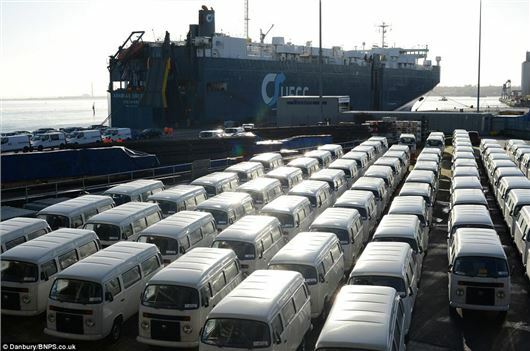 If you’re importing a car from outside the European Union (EU), you will need to pay a duty of 10 per cent on the car’s value, plus shipping costs. If the car you’re looking to buy cost you £5000 and shipping a further £1000 on top of that, then you’ll be liable for 10 per cent duty on £6000. On top that, you will pay 17.5 per cent VAT and a customs handling fee of £50, so the total costs for your import will be £6600 +VAT, plus the customs fee – £7805. Remember that many other countries have higher rates of VAT than the UK, so try and defer that payment until you get back home. Once the car is in the UK, you’ll need to get it through Customs and Excise – and although this is one of the more simple aspects of importation, make sure you get it right. You’ll need the foreign registration document and any other papers you have for the vehicle. If they’re happy with the documentation, you’ll be presented with your bill for the import duty. Most shipping agents will complete this process for you as part of their service, but do check first. If it is possible to convince Customs and Excise that the car is of significant historical interest, it’s more than 50 years old, or is one of a kind (attaining what’s known as 9705 status), then that Classic and Historic VAT rate of five per cent will kick in, and the whole operation will become financially more appealing. One often forgotten factor to consider when totting up the potential costs is storage at the docks once your car arrives in the UK. Your shipping company might not tell you this up front, they can charge you handsomely for looking after your car at the port – so don’t get stung. Make sure you get a clear answer on this before you agree to go with a particular shipping agent. If you have all these, get all your paperwork is completed, and the application accepted, two to three days later, you’ll receive your new tax disc and a UK registration document shortly afterwards. Most classic car insurers treat imported cars in exactly the same way as those originally sold in the UK. There can be a premium for left hand drive vehicles, or those, which weren’t sold over here – but on the whole the situation is a lot less complex than it used to be. The only major consideration is insurance while the car is in transit. If you’re driving it from the EU, some insurers will cover you. If the car is being shipped over, make sure the shipping company offers enough insurance to cover your vehicle in the event of a possible total loss. It isn’t always a straightforward process, though. Buying in the EU is a lot more simple than it used to be, and besides getting it MoT’d, covering your VAT payments, and getting it registered, there’s little to worry about these days. If you’re lucky, you might even get a nice driving holiday out of the experience. Buying from further afield is a bit more complex, and a lot more costly, but there has never been a better time to buy a car from the other side of the world. It’ll never be as easy as popping down to your local classic car dealer, and you do need to do your homework, and choose your shipping agent, seller, and car very carefully indeed. If you can, get a trusted third party to check out any car you’re considering buying. Follow these basic rules, and do your sums beforehand to avoid unpleasant surprises later, and importing your classic can work out very well for you.